Waking up in the morning can be a chore for many of us, but with the help of our caffeine fix we can be ready to tackle the day ahead. Just a little cup of coffee is all we ask for… That’s around 500 billion cups of coffee a year. Now imagine how many coffee grounds that adds up to. Yeah, I know… tons. 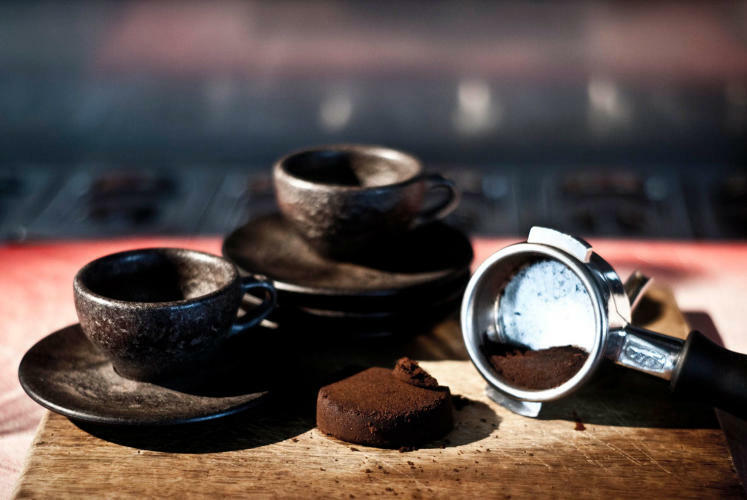 That’s why Julian Lechner, a German designer, has turned coffee grounds into coffee cups. After 5 years, Lechner has formulated a way of turning the grounds into a hard material by using natural glues and wood particles (sustainably sourced of course) and then injection-molds the concoction into little cups and saucers. Not only do these cups retain the smell of freshly brewed coffee, but they are dishwasher safe too! This neatly brewed kitchenware is called Kaffeeform. He is currently collecting the coffee grounds from Berlin cafés for his product and exhibiting his work at the Amsterdam Coffee Festival. Each cup is unique and the finished surface resembles dark marblewood. Natural aesthetic. Sustainable design. Unique appearance. Oh, and you don’t have to hand wash them. Definitely a gift for the hipster coffee drinker!